We have reached the state quarterfinals in the 11-Man classes of Kansas high school football, and the 8-Man classes will play the semifinals this week. Kpreps will continue to post state rankings throughout the playoffs culminating in our final poll after the state champions are crowned. Let’s take a look at the Kpreps.com rankings for November 7th. Check out our complete Rankings for further details. Changes in this week’s Class 6A poll occur at the bottom as No. 4 Lawrence Free State and No. 5 Blue Valley North each enter the poll this week after losses by Manhattan and Garden City. Free State went on the road at Garden City and won 42-7, while Washburn Rural ended a long losing streak to Manhattan by winning 24-21. The top three in the poll remain the same, although No. 2 Blue Valley was challenged by Olathe South during a 49-35 win, and No. 3 Shawnee Mission East needed a late two-point conversion to escape Gardner-Edgerton 36-35. In Class 5A, No. 1 Great Bend struggled but defeated its former coach Tony Crough and the Andover Trojans 16-7. Wichita Heights moves up a spot to No. 2 this week after the Falcons beat Emporia, 42-7. Goddard is ranked third after a 20-12 win over previous No. 2 Bishop Carroll. Topeka Seaman is fourth this week followed by No. 5 St. Thomas Aquinas. The Saints return to the poll after a 42-14 win over Bonner Springs and will travel to Topeka Seaman this week. The top three remain the same in Class 4A, Division I. Bishop Miege sits atop the poll after a 64-0 win over KC Piper, while Basehor-Linwood remains ranked second after defeating De Soto 21-14. Buhler remains in the third spot after blasting Abilene 45-13. Maize South moves up a spot to No. 4 this week after a 63-14 opening-round blowout of Ulysses. Finally, McPherson enters the poll at No. 5 after the Bullpups got a late Drew Labertew field goal to eliminate last week’s No. 4 Andale, 21-20. In one of the bigger surprises of the week, 4A-II No. 5 Columbus was upset 28-24 at Girard in the opening round. The Titans had defeated the Trojans 22-6 earlier in the season. Wichita Collegiate replaces Columbus at No. 5 in the 4A-II poll after the Spartans beat Clay Center, 35-7. Top-ranked Frontenac and No. 2 Pratt each rolled to opening-round wins, while No. 3 Holcomb picked up a tough 34-20 win at Scott City. Topeka Hayden, ranked fourth, gave up some points but easily handled Osawatomie, 55-34. Schools in Class 3A each played a couple of playoff games last week. Hoisington remains ranked No. 1 after wins over Lakin and Norton. The Cardinals lost their all-time leading rusher Hunter Hanzlick to an injury early in the Norton game on Saturday, but went on to win 20-0. Nemaha Central makes the jump from No. 5 to No. 2 in this week’s poll after the Thunder beat prior No. 2 Silver Lake, 21-14. Phillipsburg remains in the No. 3 spot after escaping Larned 14-7 on Saturday. The Panthers had defeated Larned 50-0 earlier in the season. Defending champion Rossville remains No. 4 after wins over Perry-Lecompton (41-14) and Sabetha (34-28). Garden Plain returns to the 3A rankings after a 12-7 win over Wichita Independent and a 34-20 win over Halstead. The Class 2-1A poll looks similar to last week’s top five with the exception of the No. 5 spot where St. Mary’s Colgan has edged Lyndon for the last spot in the rankings. Colgan built a 28-point lead in beating Olpe 42-21 in the first round, a week after the Eagles defeated Lyndon 26-20. Colgan will host No. 4 Washington County this week. The Tigers defeated Jefferson County North 18-0 in the opening round. Troy, Plainville, and Smith Center each advanced to the quarterfinals with double-digit victories. Like Class 3A, both 8-Man classes played a pair of playoff games last week. In Division I, Spearville defeated Central Plains 58-26 on Saturday to end the Oilers’ season for a second consecutive season. Central Plains was the last team to beat Spearville, 42-40 back in the 2014 playoffs. Second-ranked St. Francis has yet to allow a point in two playoff games after posting shut outs over Ness City and South Central. Burlingame remains at No. 3 after big wins over Solomon and St. Paul, while Osborne has blitzed Clifton-Clyde and West Elk in their two playoff wins. Central Plains remains in the poll at No. 5. In Division II, Hanover’s defense shut down Hutchinson Central Christian on Saturday during a 62-6 win. Central Christian had put up 108 points in an opening round victory over Lebo, but Hanover has allowed only 50 total points all season. Pike Valley remains at No. 2 after wins over Wakefield (54-8) and Hartford (60-14) this week. The Panthers will travel to Hanover in the state semifinals this week. 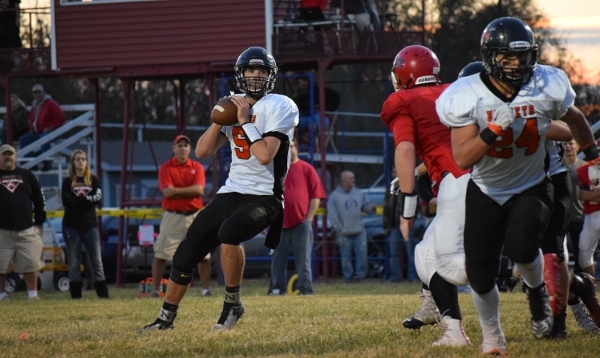 Dighton remains unbeaten after cruising to playoff wins over Lakeside-Downs and Chase. The Hornets will host No. 4 Sharon Springs-Wallace County in the other semifinal this week. Wallace County moves to the No. 4 spot after wins over Stockton and South Barber. Beloit St. John’s-Tipton moves into the poll at No. 5. The Blujays’ season ended with a 38-12 loss to top-ranked Hanover in the first round.